An Ammanford woman claims a “miracle healer” cured her paralysed dog after a vet advised he be put to sleep. Nicci Evans took Spaniel Dylan to Dr Clyde Hughes at his Shangrala Healing centre in Llansamlet following an injury to his spine. Nicci Evans, a Bereavement Councillor, told us how heartbroken she was after being told by her vet she could either pay £4000 for a second operation on her little Spaniel, Dylan, or have him put to sleep. Nicci, 49, could not afford the surgery as her insurance would not cover it a second time. She told us, “Dylan was injured while playing with dogs, he popped a disc in his back and was paralysed from the waist down. “He had an operation and was doing really well, then a year later the same thing happened again. “The insurance would not cover it a second time around and the vet suggested the best thing to do was to have him put to sleep. “My friend told me about Clyde who had actually healed her brother’s Alsatian. I felt we had nothing to lose. 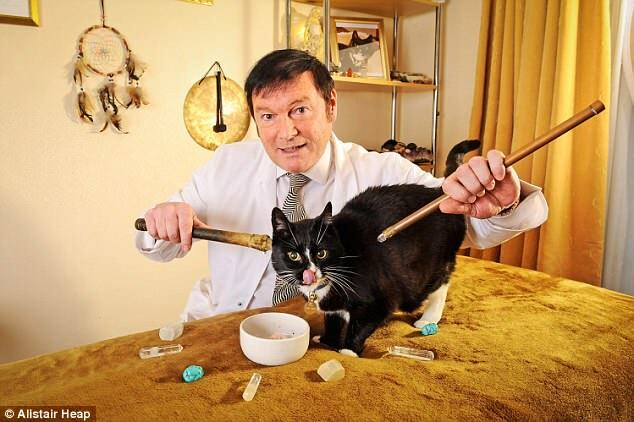 Dr Clyde Hughes runs the Shangrala Healing Centre in Llansamlet that specialises in animal healing. It uses alternative non-invasive therapies, with Reiki and spiritual healing being the most common. 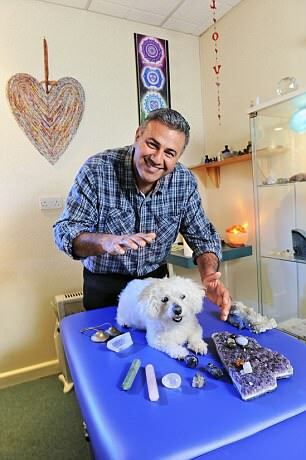 Dr Hughes, an ordained Minister, also specialises in crystal therapies and spiritual dowsing. He told us how it all works, “I started going to spiritualist church back when I was 18. “In 2000 I started my clinic treating animals and people. “I have devised a system that I call Angelic Dousing. It is basically everything I have learned over 30 years. “First of all I use divining rods which I have programmed to locate energy blocks in the body. Blocked shakras they are called. “The first thing I do is check the animal for block shakras. “The diving rods will cross where there is a blocked energy centre. “I can see if psychically but I like to let the pet owners see. “Where the blockage is where the problem is. “I can then go into the emotions of the animal and release any emotions that will block the healing, anything negative like fear or pain. Then I go up to God and tap into that energy and it is like going into a ball of lightening. “The energy is so powerful. Then I bring the energy down and direct that energy into the blockages and ask for it to be cleared. “I ask to be shown it being healed. It doesn’t always work instantly, sometimes it can take a few treatments. But the one case with Dylan, his spine was totally blocked. He was incontinent, his bowels were not getting any energy. “I brought the white light energy down into his spine and then Nicci asked how many treamtents I thought he would need. “With that, Dylan had got up and tried to run out into the waiting room so Nicci had to go chase him. Nicci told us the moment Dylan was ‘healed’ she could not believe her eyes. He lay on the floor Clyde put some crystals around him, he had what looked like Harry Potter’s wand. It must have been about an hour and ten minutes later Dyl was just so calm he was lying on the floor then all of a sudden he just jumped up and ran out of Clyde’s room. You’ve got to see it to believe it you really have. And I did. We both, my partner and I, just sat here and stared at eachother, we could not believe our eyes watching him running aroung the waiting room. So, to come out of the vets with the choice of £4000 up front now or putting him to sleep, I am so glad I took the time to step back and see what else there is out there, what other treatments. It includes other case studied that have been successes in his healing career. He said, “Five out of six dogs with serious problems, like kidney failure or paralysis, that I have treated have been healed. “I channel God’s energy. It is nice to feel you have some recognition when you do something good. It is very rewarding. “The healing treatment only helps an animal, it does not make them worse. “I will try 110%, I cannot always guarantee a 100% improvement but there is always some sort of improvement. Nicci Evans could almost feel her heart breaking as she carried her dog Dylan into the animal healer’s clinic. It was a last resort. Five-year-old Dylan was paralysed after slipping a disc a few days before and the local vet had suggested putting him to sleep. For Nicci, 49, the thought of losing her best friend was unbearable, so she gambled on one last throw of the dice and made an appointment with an animal healer. ‘When I carried Dylan into the clinic,’ she says ‘he couldn’t move his back legs or wag his tail and he was just miserable with pain. I felt guilty for dragging him there. ‘Even as the healer worked on him, I was sceptical. I couldn’t believe anyone could help a dog in such dire straits. No drugs had been administered, only the ancient art of ‘healing’ had been used. ‘Healing’ is a broad term that’s used to describe many different types of alternative therapies, with reiki being the most common. Others include crystal therapies and spiritual dowsing. They all work slightly differently but are based on the concept that there is unseen energy flowing through us that keeps us alive — and if the balance of this energy is disturbed, we become ill. The theory is that a trained therapist can restore the flow so we’ll feel well again. In our fast-paced world with its emphasis on science and powerful drugs, it sounds ridiculous. But thousands of people across Britain swear by it, claiming it helps them beat stress and speed up healing. And it’s not just used on humans. In February, the Mail revealed how healer Avril Priestley had stunned vets by curing her dog Ella this way after a diagnosis of terminal bone cancer. But until a few years ago, if you’d asked Nicci, an NHS bereavement counsellor and patient liaison officer, whether she believed in it, she’d have laughed. Now, as the sound of a healthy Dylan playing with his squeaky toys fills her home every day, she’s a convert. The problem began when he was three and injured himself playing with some other dogs. ‘I didn’t see how it happened but he took to his bed and wouldn’t move or eat,’ says Nicci, a mother-of-two from Ammanford, Carmarthenshire. Two years later it happened again, spontaneously. ‘The vet told us it would probably keep happening — there was obviously an underlying problem. Each time we were looking at £3,000 for an operation plus £1,000 for physio. The insurance wouldn’t pay out because it was a pre-existing condition. More importantly, could we keep putting Dylan through all that? The pain and surgery? It was then that Nicci recalled how a friend’s Alsatian had been helped by a healer called Clyde Hughes. ‘I wasn’t convinced — we were talking about a dog needing major spinal surgery — but my partner, Phil, said “What have we got to lose?”’ By the time they got to the clinic, Dylan had deteriorated. ‘He was looking at me as if to say, “Mum, give me a break!” and lying on the floor, unable to move. It was unbearable. ‘Clyde put a crystal either side of Dylan and ran a divining rod — like a wooden wand — over him. He put his hands on Dylan, saying there was a blockage in his energy in his back and he was channelling lots of good energy. ‘Phil and I kept looking at each other as if to say “What is he doing? Whatever does he expect to achieve waving a wand over the dog?” I kept thinking how embarrassing it was going to be to have to carry the still-paralysed dog out and thinking of ways not to make Clyde feel bad. ‘But then, after about 75 minutes, there was a miracle: Dylan jumped up on all fours and shot off. I had to chase him to catch him. ‘Words can’t describe how I felt. I was utterly amazed and could barely believe it. Clyde, 54, has been a healer all his life. His grandmother was a psychic, and as a child he’d see healing sessions at his local church. As an adult he studied many different forms of healing, and went on to gain a doctorate in complementary medicine. Clyde, from Swansea, uses divining rods to scan the body. ‘With Dylan, all his spine was dark so I held crystal rods either side of him and connected with pure energy. To a layman, it sounds ludicrous. How can anyone summon an energy and put it into a dog? And how can it cure something as serious and as acute as paralysis? The vet said Thomas, as the cat became known, had been hit by a car and damaged the nerves in his spine, affecting his tail, bowel and bladder. ‘An operation wasn’t possible so I started giving him healing every day for an hour. I’d put my hands on his spine and place energy into it. But there seems to be little scientific evidence that reiki, or any other form of healing, actually works. Indeed, Britain’s only Professor of Complementary Medicine, Edzard Ernst, has described it as ‘nonsense on stilts’. John Fishwick, president of the British Veterinary Association, told the Mail: ‘The BVA does not support the use of alternative therapies that have no rational evidence base. Detractors say that success stories are simply a matter of coincidence — the animal would have recovered anyway. But type a term like reiki into a search engine and you’ll be inundated with stories of the ‘miracles’ it’s supposedly performed and of people converted to its power. One such convert is Lynne Robson, who believes her dog Kiki only survived eating two chocolate eggs during Easter 2015 because of healing. Lynne, a 56-year-old business trainer, hadn’t realised just how toxic cocoa is to dogs, and it was only when she saw her springer spaniel lying almost lifeless in the garden next day that she realised something was wrong. ‘She was in a bad way, not even able to stand, so I rushed her to the vet,’ says Lynne, from Bridgend, South Wales. ‘Her stomach was pumped and she was given charcoal to counteract the chocolate, but it didn’t work. We watched her getting weaker — you could see she’d lost the will to live. Kishan was Kishan Takahashi, a Newport-based healer who’d helped Lynne with a skiing injury to her knee a few years before. ‘If he couldn’t do anything, then at least I knew I’d have done everything I possibly could for Kiki,’ says Lynne. ‘Kishan started by looking into Kiki’s eyes, stroking her and placing his hands on her head. After an hour she looked brighter so I thought I’d let her carry on to see how she did.’ Lynne took her home, but a few days later Kiki started walking with her head down. The vet diagnosed a brain haemorrhage and said that she should be put down. Instead, Lynne took her back to Kishan. He does seem to have an impressive cure rate. Ten-year-old dog Bonnie was brought to Kishan suffering from chronic inflammatory bowel disorder, following three days in a veterinary clinic when the vet had initially warned her owners that she wouldn’t survive the night. 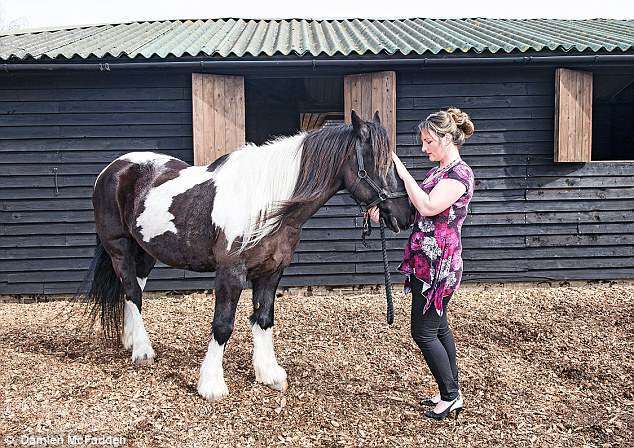 Sarah Berrisford, 32, from Peterborough, believed in healing so much that she learned how to become a reiki master to help her horse recover from an accident. After two day’s rest, 13-year-old Pancho still hadn’t recovered so Sarah called the vet. Sarah’s grandmother had been a healer, so she did a one-day course in the subject and began laying hands on Pancho. So Sarah redoubled her efforts, taking another reiki course and giving him healing up to five times a day. ‘I’ve never felt so driven,’ she says. ‘This time, I was more instinctive about where I laid my hands. Before, I’d put them on the injury; afterwards, I put them wherever I felt they were needed. ‘My hands would get hot and my legs would ache exactly where Pancho was injured. I started to feel I was doing some good. That was 11 years ago, and today Pancho is a stately 24-year-old. Whether we’re really capable of healing an animal with our minds though, remains open to debate. In many ways, the Reiki first degree course is the most exciting because this is when you will be introduced to the energy for the first time and you will be presented with the opportunity to develop yourself spiritually by learning to carry out specific daily meditations and self-treatment meditations. You will also learn the skills necessary to carry out an effective Reiki treatment on family and friends. A one day intensive course with a weeks home study required before the course date. Many students find that after completing the first degree they simply wish to: Take their studies further and learn even more about Reiki. Become a professional practitioner and learn how to treat clients and be able to have access to professional insurance. This course is suitable for someone who wishes to develop themselves further by becoming familiar with the two master symbols as well as several other symbols. By studying this course an individual will learn to strengthen their ability to channel Reiki even further. I provide a range of healing treatments at my Shangrala Healing Centre in Swansea, South Wales. I also offer distant healing. Below is a brief explanation of the different types of healing and services that I can provide. If you are new please just book an appointment and we can discuss your needs and the best form of healing to suit you. I use my psychic abilities to see if your chakras (energy points) are blocked or out of balance. Then I work on each chakra to cleanse and repair them for you. If your chakras are out of balance you can feel drained of energy, lifeless, lack drive and ambition in your life and often feel depressed. Balancing and repair of the chakras brings a new sense of joy and purpose to your life with added vitality. Psychically I scan your entire energy system in the body to find any energy blocks that need to be released and cleared. I then replace these blocks with vital energy. As a Spiritual Healer, I work with my family of Spirit Guides. These Guides use the Healer as a channel to transfer their chi energy through the Healer to the patient. Angel healing is the same but instead of Spirit Guides, Angels work with the Healer to channel their energy to the client. The healing attuned to this energy is like tuning a radio to a certain channel. The Healer connects with this energy and channels it to the client. I work with athletes, business people and the general public to release limiting beliefs and fears that hold them back from achieving their goals in life. This is when the body is scanned and the healing energy is directed to those areas that are holding energy blocks and trapped emotions which are then released. 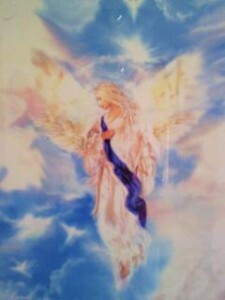 As a psychic I am able to tune into your Guardian Angel, Spirit Guides or loved ones in spirit. I cannot promise that I can connect to specific individuals. Your Angels, Spirit Guides and loved ones can relay information which can help you to make sense of what is going on in your life. This is a wonderful healing process. Through accessing your subconscious mind, hypnotherapy can help you to learn how to react differently to certain situations and help you to understand the development mechanisms of your mind. This can help with releases of past life experiences which are still having a detrimental impact on the present. You can’t erase and forget the past but you can learn to feel differently about it. It also helps with stress related problems and phobias. If you need help to deal with life’s difficulties, I can help you to release your problems, fears, phobias and emotional blockages. This can bring harmony and joy into your life. If you are experiencing any disruption or negative energy in your home or property, then I can help. Just send me a photo or plan of the property and I can then dowse to find the disruption or negative energy and remove this and resolve this problem for you. There is a cost for this service. Please ask for details. ANGELIC DOWSING – THE PATH TO DIVINE HEALING . LEARN HOW TO HEAL PEOPLE AND ANIMALS…Author Clyde Hughes Available to purchase TODAY either on Amazon or direct from the author. Clyde Hughes shares with you what he has learnt over more than 30 years working as a healer, medium, dowser, space clearer and exorcist. Clyde runs an animal healing sanctuary and all proceeds from this book will go to help run his sanctuary. I have had amazing things happen to me over the years; some good; some bad, which I’ll share with you in this book. This book teaches you how to perform healing on people and animals, how to dowse from start to finish and how to locate by dowsing your Spirit Animals, Guides and Angels. This book includes a powerful chakra clearing meditation and a clearing protection prayer from Arch Angel Uriel. Clyde shares with you case studies of miraculous healings. I use divining rods and the pendulum to actually locate energy blocks in the body and to locate blocked chakras. This book teaches you to find any negative energy /spirits that have attached to you which can bring ill health and exhaustion. Are you feeling depressed and drained of energy and cannot shut your mind off ? Find out what could be causing it with this book. Clyde will show you HOW TO – Dowse from start to finish. Select and programme your divining instruments . Find energy blocks in your body. Check crystals for negative vibrations and how to clear them . Check your aura and chakras for blocks or damage. Check your beliefs..find out what your subconscious mind is thinking. Check yourself for curses and vows that can bring you poverty bad luck and illness. How to set a Crystal healing grid. Find out how to locate your guardian angel and how to do smudging and space clearing. If you would like more information on this book please feel free to contact the author . I first brought my 12 year old lurcher Aris to clyde in may 2016 in desperation, having read Clyde’s website . Aris had suddenly started suffering with sciatica and had been giveno 3 different types of painkillers . Vets had suggested that I should consider euthanasia for aris if each of the 3 painkillers did not work , which caused me terrible distress as I new in my heart that he was not ready to go . The medications did not work and seemed to be making him much worse not better. He was restless and unhappy I nursed himy during this time I wad ready to try anything. I prayed and asked for help and remembered that some months before I had seen the Shangrala website. After the initial appointment with clyde, Aris began to get better. I was able to stop all medications. Clyde is very gentle and caring get towards aris and treats him as a special being and always explains things to me. I learn something new each time we attend and I feel relived that someone u derstands how important aris is . So actually I feel better to ! Getting good arise to a decent state of health and restoring his quality of life seems to be very important to clyde which was different to the vets which took the medical approach only. I feel aris is now much better 5 months on without any medication and with monthly treatments at Shangrala Healing Centre Swansea. I felt that as well, as getting arise better, Clyde’s treatment have given me valuable time with my precious senior dog. Back in may , I had somehow got talking to a total stranger in neath about Aris and his treatments and the lady said to me !! I took my little dog to clyde you are in safe hands there, because that’s what you want isnt it ? Peace for them towards the end of Thier lives ! !